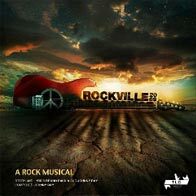 In a world of chaos and complication, Rockville 2069, is a rock musical of Hope, the Universal Power of Music and Love. Cliff: The year is 2069. Greed, conflict, neglect and excess are exhausting the world’s resources and bringing the earth to its knees.But tonight, we stand as one, united in peace, in love, in music, to stop this madness and to celebrate the centenary of the Woodstock music and arts festival here in upstate New York, just like it was all those years ago. And just as our forefathers upheld the philosophy of peace and love, and make music, not war, so too shall we uphold that legacy. We shall take a stand against the destruction of our earth, our home.The bands that have come together are all descendants of the families and musicians that attended that original festival back in 1969. They represent the 3 iconic legendary music styles which had their origins in Rock..
Rockville 2069 musical graphics intro from John DeVries on Vimeo.